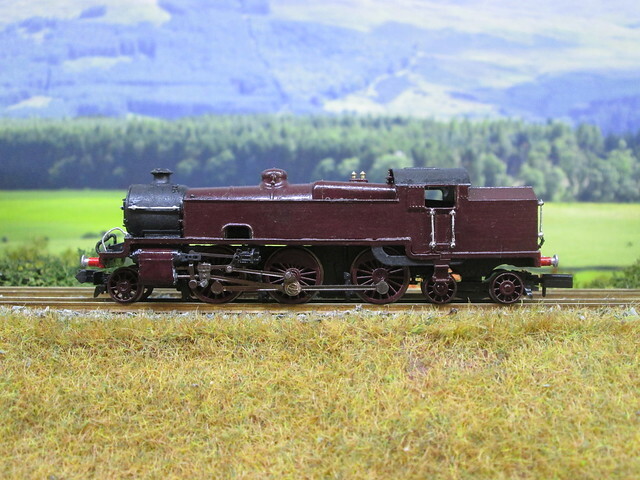 Recently I have seen many applications of the Farish N Mogul as a basis for other models, I guess it because of a current shortage of '2-6-0' and '0-6-2' models that it is perhaps a desirable choice. 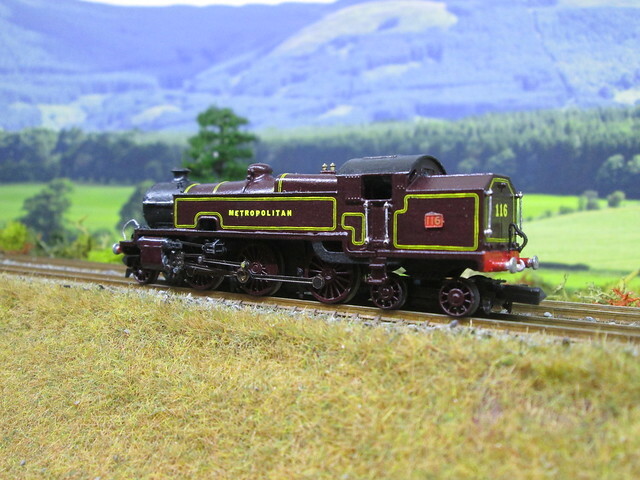 However back when the N mogul was first released by Farish, I suggested perhaps the most logical choice of locomotive to use the N as a basis for, the Metropolitan Railway K class. The logic behind this lies in the history of the prototype, to summarise, the K class came about when some N class locomotives were built by Woolwich arsenal as kits of parts but the Southern Railway did not want them. 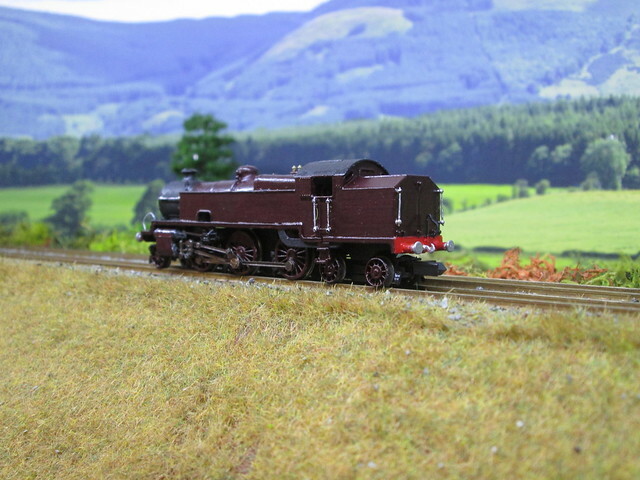 The Metropolitan bought them and designed a tank engine around the parts, 6 were constructed in all, they were used on mostly freight between Verney Junction and Finchley Road, but sometimes stood in on passenger workings between Verney Junction and Rickmansworth. They were absorbed into London Transport stock along with the rest of the Metropolitan Railway in 1933 and the LNER bought them along with some other ex Metropolitan stock in 1937. 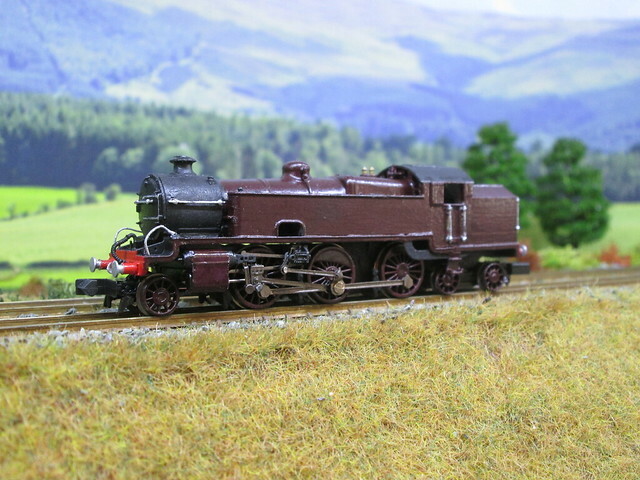 They were withdrawn between 1943 and 1948, the last 2 making British Railways ownership but not receiving numbers. 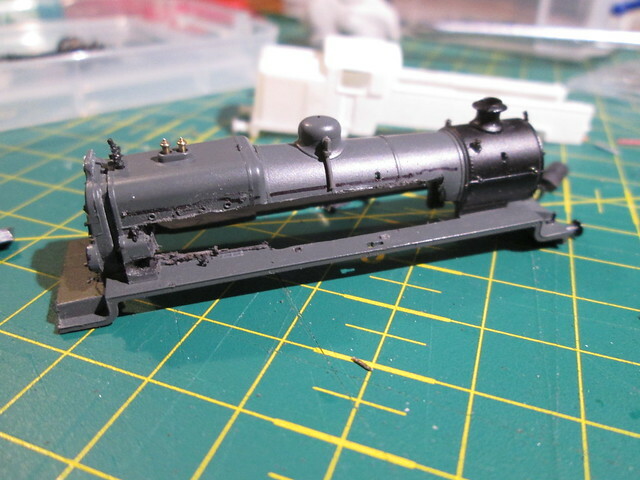 They kept many of the original N parts for their entire lives, with cab, tanks and bunkers designed by George Hally around the existing parts with as little alteration as possible, however least one member of the class received an LNER standard smokebox door. 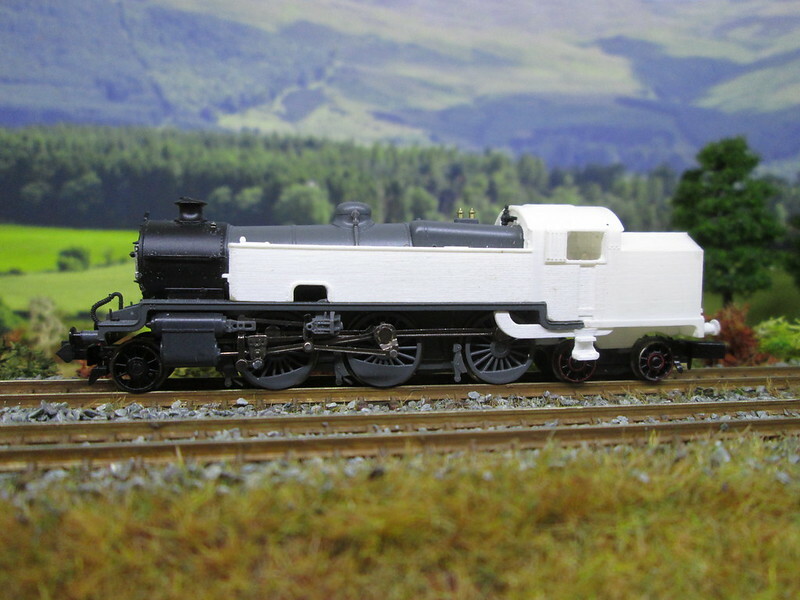 A few months ago, off the back of a conversation with Max Brayne who runs Mountaineer Models took on the project to create a 3D printed, cab, tanks and bunker to turn a Farish N class into a K class. 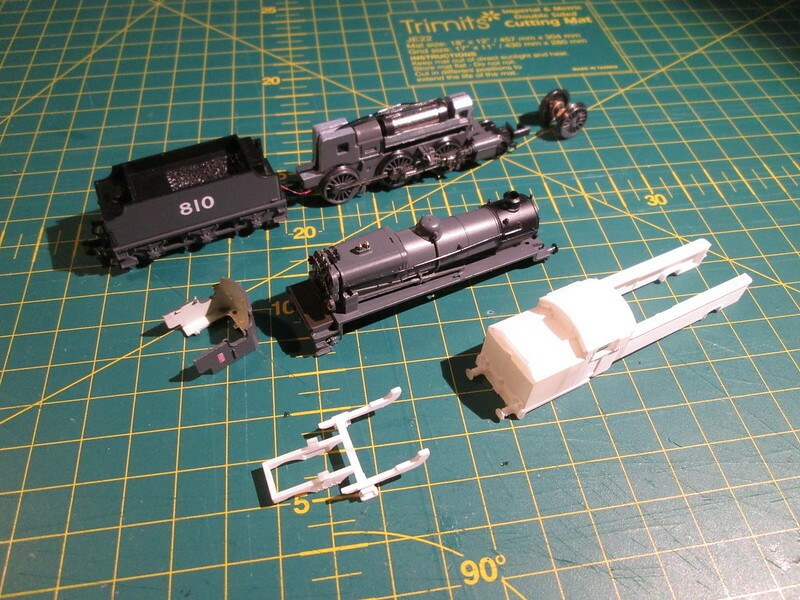 Additional parts required from the spares Bin are a spare Farish B1 front bogie (not shown in those photos) and a spare set of N mogul leading driving wheels. First job is to remove the tender. it is not required, neither is the cab. put those in a your spares bin. 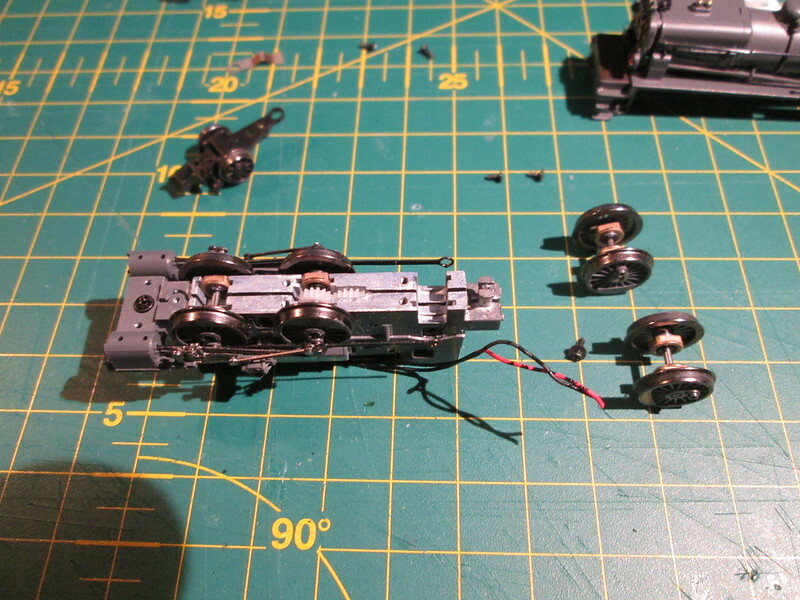 Then swap out the trailing set of driving wheels for the spare leading set, this will allow all 6 driving wheels to pick up, rather than the leading 4 only, the trade off is that you will no longer have traction tyres. Now cut off the cab steps ready to fit the print. this may require a little further filing on some surfaces that join together, i found i had to remove some pipework from the boiler in order to fit the print. you can test fit it at this stage. 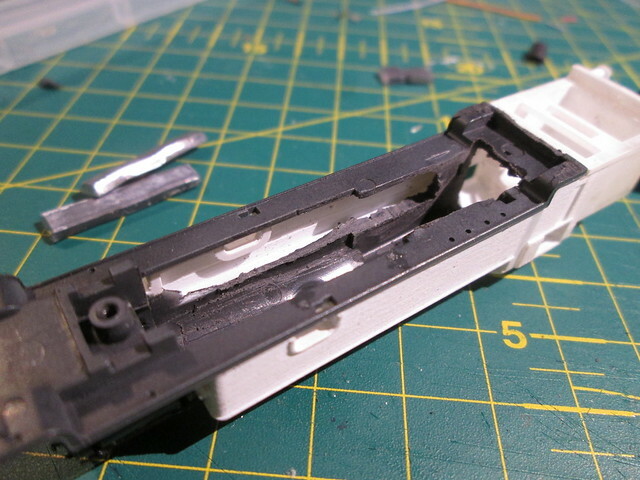 Cut off the pin that the tender previously coupled to, and file up into the block, at least 2-3 mm, to allow space for a thick piece of plasticard. 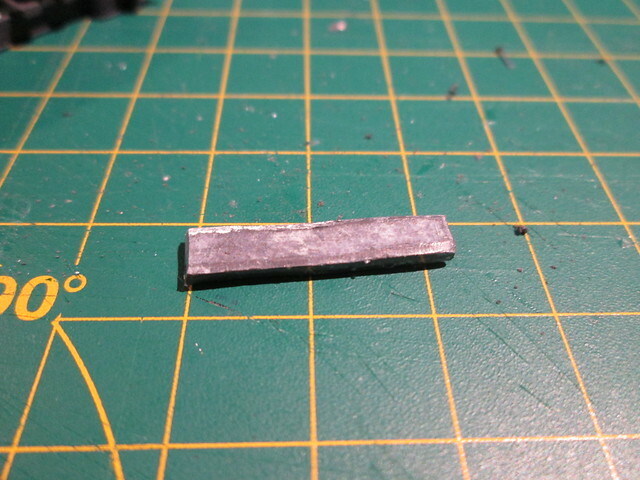 Stick the plasticard to the block on the filed surface and drill into the plasticard a hole to screw to the rear bogie arm into it. 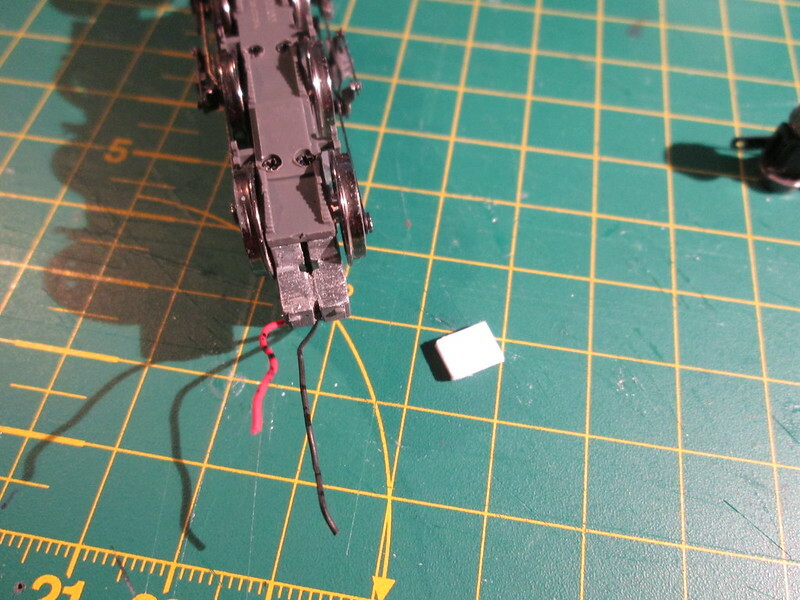 DO NOT go right through the plasticard with the screw, due to the chassis being split a screw could easily cause a direct short so best test with a multimetre before running that both halves of the chassis are insulated to each other. 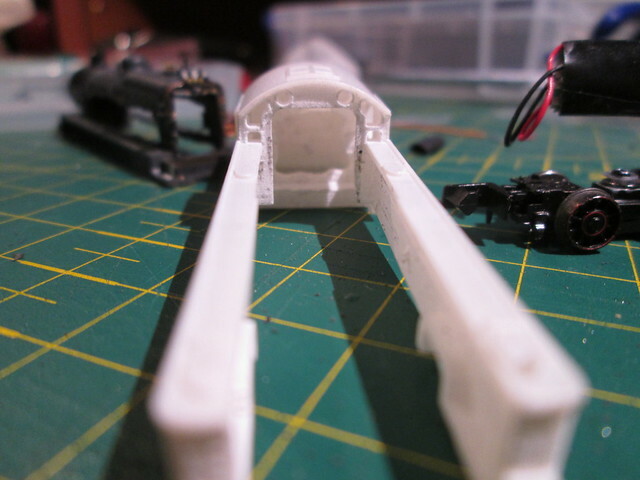 Then test fit the body with the print to check the bogie is in the right place and can swing freely. That is all for now, more coming soon. 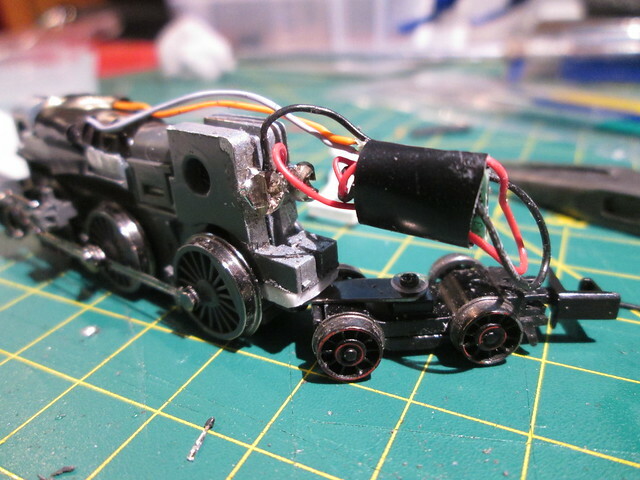 So at this point you need to drill holes into the chassis and screw terminals and if using DC wire directly to the motor terminals, or as in my case wire to a DCC chip with enough slack to allow it to sit over the rear bogie. 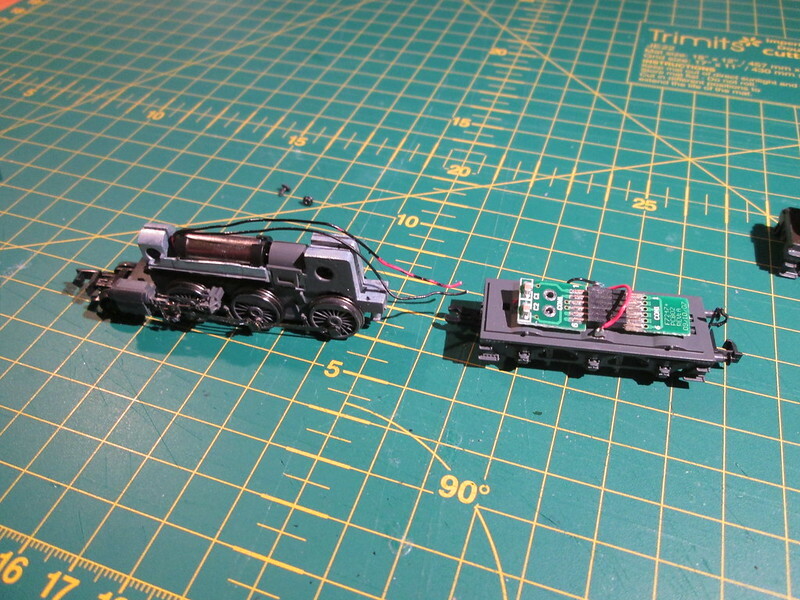 This presents a problem however and it is solved by drilling and filing I am afraid, both DC and DCC versions will require the backhead being drilled out to create space for a the screws that provide solder terminals. 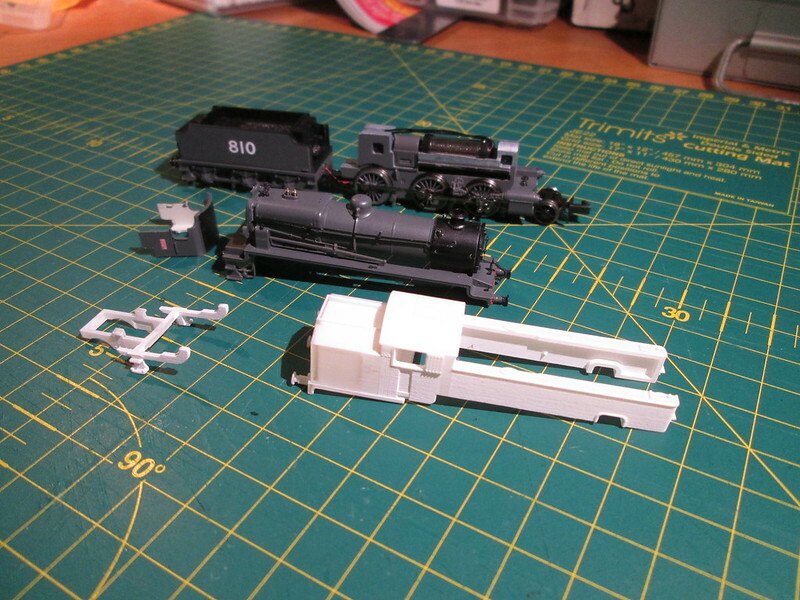 I have also cut out the boiler sides that will be hidden behind the tanks, this is an optional approach and I shall explain why I have done this shortly. 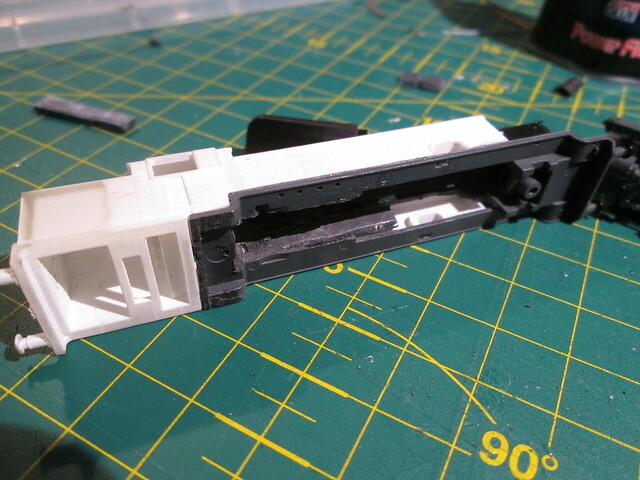 This hole allows the DCC chip to be located inside the cab, but as my chip didn't quite fit I had to cut a hole in the back of the cab on the print so the chip in fact sits mostly within the bunker. 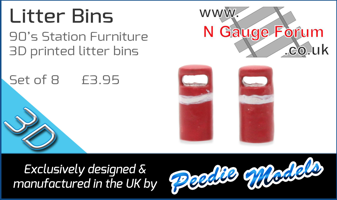 A test fitting is recommended to ensure your chip fits into the bunker/cab area, however be careful, this is a fiddly process and can take a little patience to work. I used the tip of a cocktail stick to help move the chip into position through the cab sides. 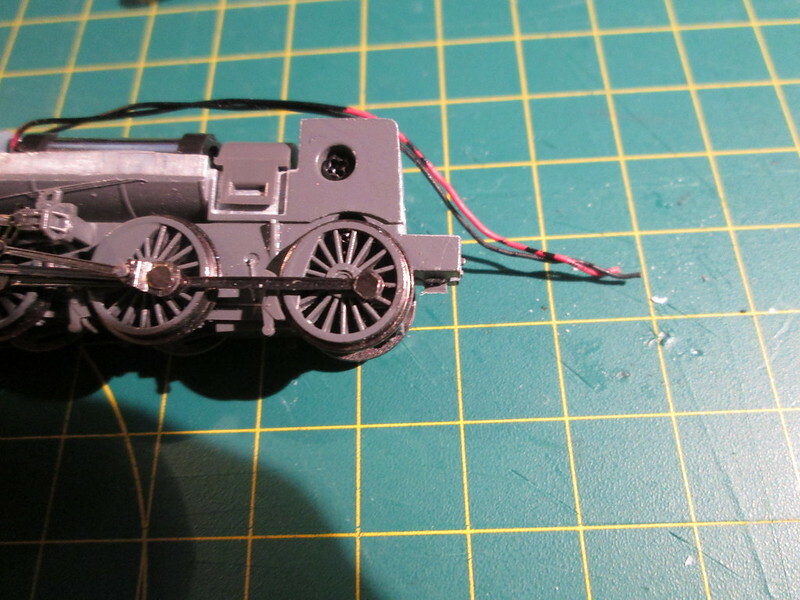 Now for the boiler sides, I have cut out the sides that are hidden behind the tanks, the line seen on the boiler side shows where the boiler is visible above the tanks, due the curvature of the boiler I did not go up to this line because if i did you'd be able to see the hole from the outside when the loco is completed. 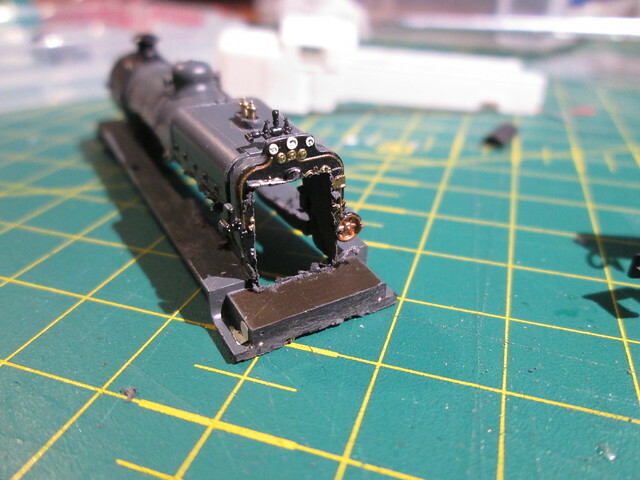 The reason for these holes is to maximise traction and electrical contact I have opted to put strips of scrap lead inside the tanks, their perfect location over the driving wheels will balance the locomotive too. 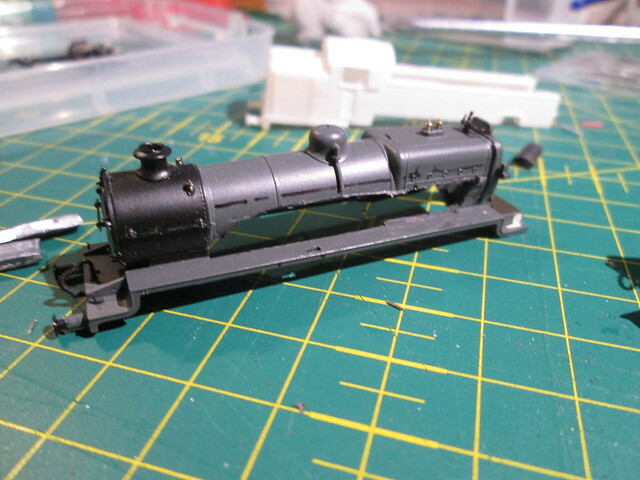 Once completed, check the body fits once again (it is easy to put too much lead in and have fitting issues and it's best to solve them before handrails and painting! 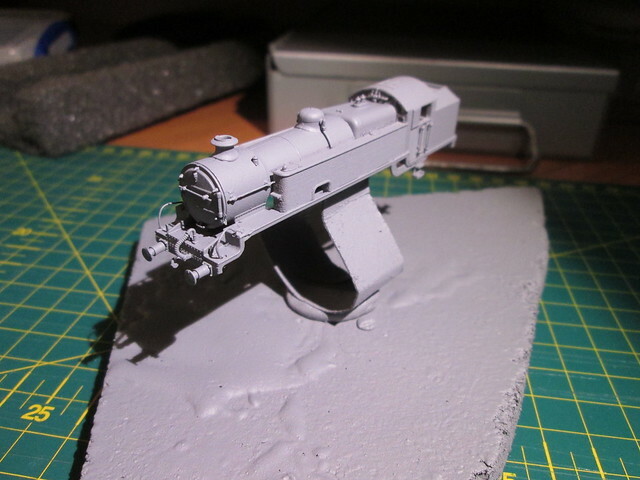 Next stage is to add the handrails, I had to drill my own, but i believe the print is now sold with pre-drilled holes. I used handrail knobs and wire sold by N Brass for this. 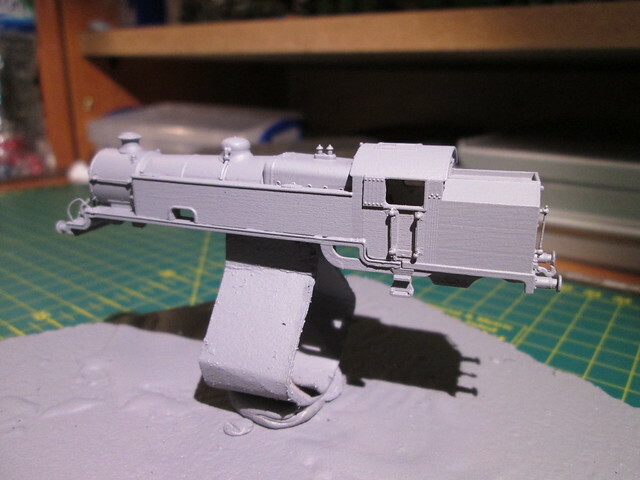 Additionally add the rear vacuum pipe and coupling, the ones supplied with the N class will fit perfectly to the print. 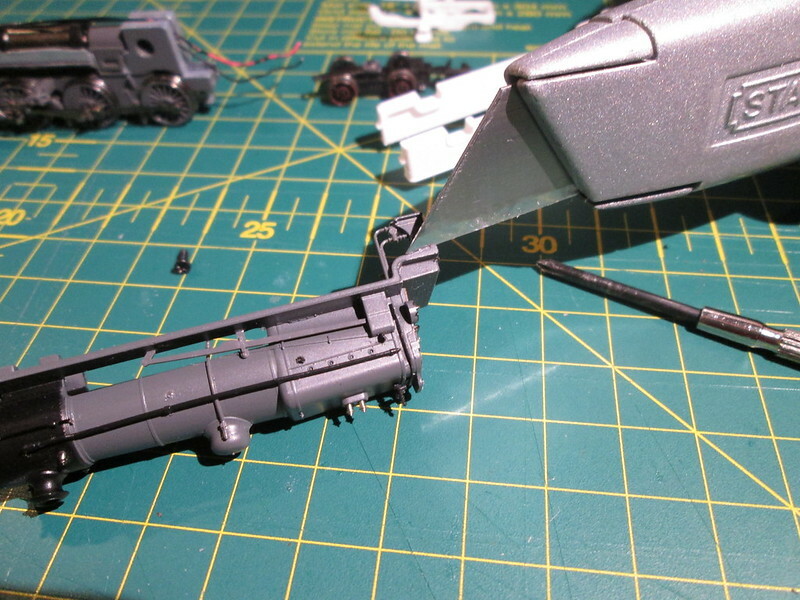 Then it is on to painting, I am sure we all have out own techniques for this, but personally I always start with a halfords grey primer as a base coat. That is what I call an RBD (Reet Bobby Dazzler) ! Congratulations for imagining this in the first place and the final result. 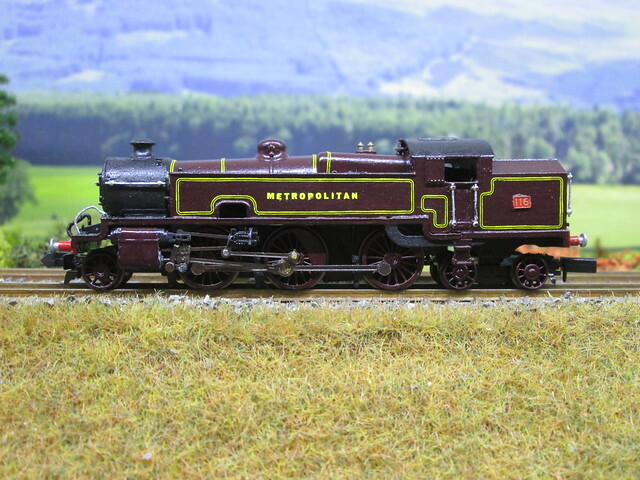 Just bought an N class from Rails at a bargain price, not sure if I have the bottle to chop it to bits to achieve the fabulous Metropolitan loco you have created. Very nice! I've been following this for a while, good to see it is available. 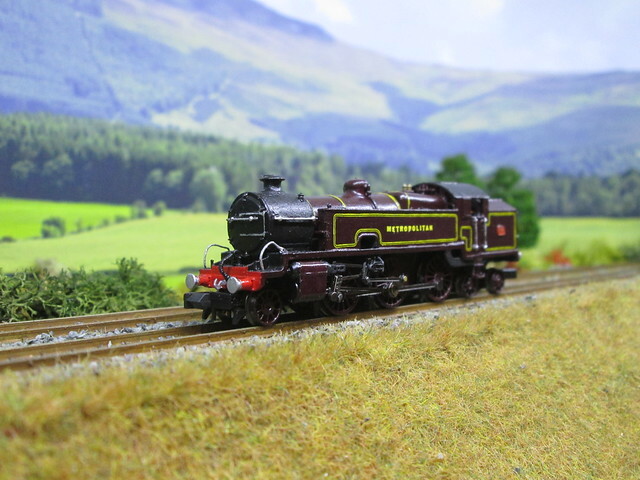 Our club are modelling Aylesbury in N, set mainly in the mid 50s. A K is about 20 years too early, but what the heck!